Once started on a mission to create something I frequently end up creating several different things as a consequence of the mental stimulation. Sometimes the connection is clear, sometimes it is subtle and other times there is no apparent connection whatever. Those cases usually arise as a folding accident or because I take time out from the challenge which is occupying me. 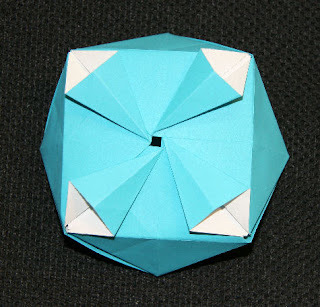 The Tomoko Twist Challange produced one creation which has an obvious connection to the challenge which spawned it and one which is more subtle. 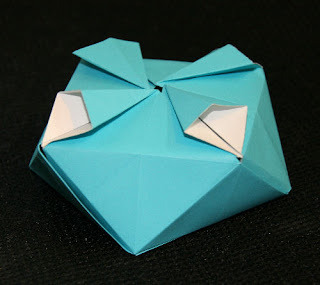 We will start with the oblique triangle sided box shown here. It has obvious design similarities to the box of the last posting but the mode of construction is actually quite different. The twist is on the floor of the box. The walls are held together by tucking the side tabs in between the wall sections. 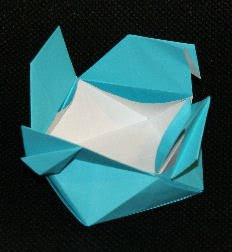 The top is covered by tucking the top tabs under the adjacent flap in a clockwise direction. The petals sandwich the flap between it and the tab underneath. The crease pattern has some lines in muted tones. These are additional creases which may be added for thin paper or if you want the walls to be extra sturdy. They are generally not needed.